The Raupo Essential Maori Dictionary is an invaluable introductory dictionary for students of te reo Maori. It features: clear, easy-to-follow Maori-English and English-Maori sections, with the Maori and English alphabets at the top of each page, all the words a learner is likely... read full description below. 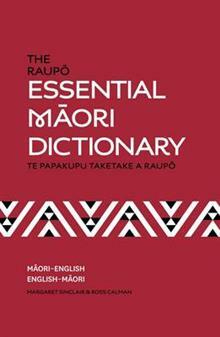 The Raupo Essential Maori Dictionary is an invaluable introductory dictionary for students of te reo Maori. 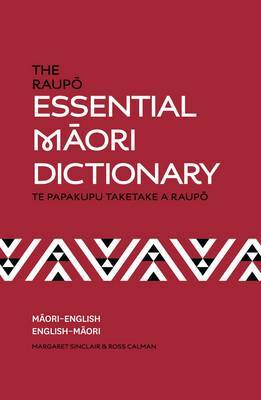 It features: clear, easy-to-follow Maori-English and English-Maori sections, with the Maori and English alphabets at the top of each page, all the words a learner is likely to encounter, including contemporary usage and modern terms, a section of themed word lists, including days of the week, months of the year, numbers, cities of New Zealand, colours, emotions, actions, parts of the body, in the classroom, and on the marae. Ross Calman is a freelance writer and editor, and the author of many popular works on Maori language and history - The Treaty of Waitangi, The Raupo Essential Maori Dictionary (with Margaret Sinclair) and The New Zealand Wars among them. He was also the revising editor of A.W. Reed's The Raupo Book of Maori Mythology. Of Ngati Toa, Ngati Raukawa and Ngai Tahu descent, he lives in Wellington with his wife and two children.